Getting Full Coverage for Hail and Wind Damage to Churches | The Voss Law Firm, P.C. The costs of insuring a church against wind and weather damage can be astronomical, but policyholders will gladly trade the money for the peace of mind the coverage affords. However, hidden exclusions and confusing policy language often leaves claimants with less than they paid for, turning an unfortunate situation into a heartbreaking loss. Attorney Bill Voss examines common limitations in church hail coverage, helping policyholders to understand and select options that will maximize their claims. A strong policy can save you from placing the burden of repair costs on the congregation and allow you to begin and complete repairs as quickly as possible. Unfortunately, many people overestimate the amount of their coverage, leaving them on the hook for a large portion of the damage. Exclusions. Insurance companies often limit coverage for churches in Texas, where hail is a common and costly occurrence. In many cases, wind and hail damage is specifically excluded from a standard church insurance policy, as is “wind-driven rain” and protection from damage due to natural flooding. Higher deductibles. Even if a policy includes coverage for wind and hail damage, these contracts often have special “wind and hail deductibles” that can cost several thousands of dollars. These high deductibles may cost even more than simply paying out-of-pocket for the damage. Direct damage. No matter how hard you try to limit damage to your church after a storm, there may be many aftereffects that add to the overall cost of repairs. Many insurers know that a single event can “snowball” into a multitude of damages, such as lightning causing a fire that results in water damage from fire hoses. Unfortunately, policies may limit their coverage to “direct damage,” meaning the direct effect of the peril. A hail policy may cover broken windows and damaged roof tiles, but will not cover rain seeping in through the roof or looting from thieves entering through broken windows. Per-occurrence deductibles. Since many kinds of damages can arise from a single storm, you should examine whether your deductible applies “per occurrence.” This means that you will only pay one deductible for all of your covered property damages from the weather event. Without this protection, you could end up paying separate deductibles for each type of damage that occurred due to the same storm. Basic, broad, and special coverage. The type of policy you have will dictate how much of your losses are covered. Basic policies afford minimum coverage, special policies cover nearly everything, with broad coverage falling somewhere in between. In addition to policy type, you should also check which coverage additions and extensions you have selected and the limits of each one. Matching materials. 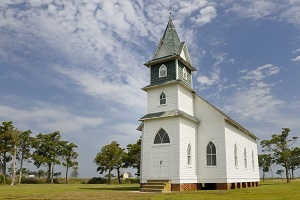 Unlike other commercial buildings, churches may contain old and valuable building materials inside and out. From hand-carved railings to limestone bricks and marble flooring, it can be extremely expensive to restore these elements to a like-new condition. Some policies refuse to pay for “matching” the damaged materials to the existing structure, creating aesthetic differences that greatly devalue the structure. Depreciation. It can save policyholders a lot of money in premiums if they select an actual cash value rather than replacement cost policy. However, when a loss occurs, the insurer will only pay for the depreciated value on the church building—not the full amount it will take to restore the structure. A property damage policy may not have the ability to replace hundreds of years of religious worship and history, but it can keep your congregation from attending another church as you undergo repairs from a storm. If you are having trouble getting the full value of your hail damage claim, the Voss Law Firm can investigate the details, examine your policy, and fight on your behalf. Simply fill out the contact form on this page today or order a free copy of our book, Commercial Property Owners Must Read This BEFORE Filing an Insurance Claim.